WHY USE A VIBRATING FOAM ROLLER? Our vibrating foam roller combines the time tested methods of sports massage and foam rolling into the perfect fitness recovery and mobility device. It feels amazing on your sore muscles and joints. 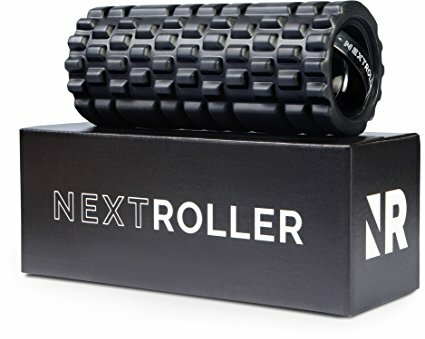 Whether you're seeking faster and more efficient recovery from your workouts, improved mobility, or rehabbing an old injury, the NextRoller can help you reach your fitness goals. Our product has stood the test of time: check out our reviews! We've helped thousands of happy customers meet their fitness goals. We stand behind the NextRoller completely and are committed to delivering an incredible product at an accessible price. Highly Portable: Take it on the Road! There are 3 levels of vibration on this roller - Levels 1, 2, 3. The vibrational frequencies are at 20, 40, and 67 Hz. My body personally feels the best using Levels 1 & 2 and this for me seems to stimulate healing quicker. All 3 of these frequencies is what you would find with an average TENS unit. A TENS unit helps stimulate endorphin and seratonin production, which help with pain relief, healing, making you feel better overall. Level 1 (20 Hz) seems to help me more with chronic pain. Level 3 (67 Hz) seems to help with acute pain. I am also using the NR to help me with mobility type exercises and I think it's a great tool for that. Rather than having to buy several tools that could easily cost a few hundred, all this is wrapped up in this roller and it's great. Though the price of the Hyperice Vyper has come down, because of the reviews I read on that with often not having great customer service, I went with the NR because sometimes things do go wrong and you want the company to be positively responsive to address the issue. The NR also holds a charge for quite some time. I've only had to charge it a few times since I've gotten it and maybe the average use of it per day is about 15 minutes. I haven't tried to see how long it will go before it doesn't work and I have to recharge. I believe since I charged it, it was about 7-8 days ago. So I say again: Rolling with the NextRoller Vibrating Foam Roller was PAIN-FREE, and took only one pass for each area. To test if the rolling actually worked because I'm so conditioned to expect nothing without pain, I just rolled myself on my regular roller, and lo and behold, I had almost no tender spots left. And by tender, I mean hypertonic, hypersensitive areas of muscle that are pathological (not good). I am so very sold on this device, and am looking to see if there is any formal research coming out. Current research (Brunetti et atl, 2006) has shown dramatic and long lasting improvements in strength and balance, both often severely compromised after surgery, from local application of 100 Hz vibration for 10-15 minutes after surgery. This device is clearly lower in frequency, and probably less effective as a sensorimotor / proprioceptive activation device, but its frequency definitely covers that of the pain sensors based on my experience.